Mass to niche: the way forward for sport retailers? A recession always brings about changes in customer behaviour; a tightening of purse strings and a re-evaluation of what they value from purchases being the most common. The recent recession was no different. Customers increasingly are demanding better experiences, better quality, better knowledge, better value and longer lasting items from brands – they take added time in making decisions on purchases because margin of income dictates that this makes most sense to the consumer. What does this mean for sport retailers? Well, customers appear sick of getting poor advice from poorly trained staff, in environments that seem to push all and everything at them. See how Apple have addressed this in their retail environments; staff that have better training and can interact with customer, more focused and relevant offers and flexible store environments. They have rode the economic storm and reaped the benefits. Step forward Footlocker. They are currently testing a pilot scheme in New York City where by they have created a specialist retail environment for runners called, ‘Run’. The focus is better equipped staff, better advice and more focused offers, making sure customers walk out of the store with the best product for their needs. Buying running equipment can seem like a daunting experience when you don’t know what you are doing, especially when you are surrounded by all kinds of products from what seems like every possible sport and staff that have been spread too wide that they don’t really know what they are talking about. Foot locker have created a niche offering around a popular sport, directing attention to what customers are increasingly demanding. 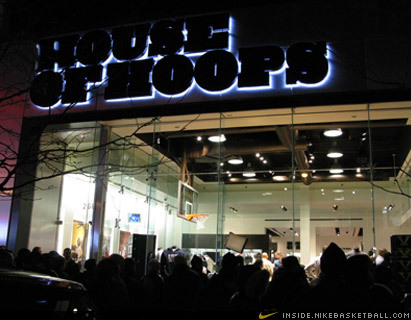 Last year they did the same when they combined with Nike to create ‘House of Hoops’ for Basketball fans and players alike, again in New York City. Is this the way forward for Sports Retailers who value and need a presence on the high street? Maybe the strategy involves a few big, key multi sport stores and lot of little specialist offers like what Foot Locker are starting to do. Maybe then sports retailers will start being relevant again, not just for me but also for other hardened consumers across the globe.